Let the Road Trip Begin! The weather looked pretty dismal as our flight touched down in Christchurch. We walked out of the airport into a freezing torrential downpour and realized pretty quickly that our first stop needed to be a shoe store. Sandals don’t quite cut it during early spring in New Zealand. Our first stop wasn’t actually a shoe store because we had to pick up our rental car first. They say that driving a car is like riding a bike; once you learn how to do it, you’ll never forget. Whoever “they” are, they obviously have never gone nine months without sitting behind the wheel and then rented a car in a place where you drive on the left side of the road. After accidentally hitting the windshield wipers instead of the blinker about 100 times and continually repeating “stay to the left, stay to the left” every time we made a turn, we successfully navigated our way to Kmart without causing a single accident and were able to procure our much needed shoes. We know that it isn’t well known for having the best shoes around, but our plan to camp and road trip around New Zealand for the next month meant that we needed to purchase quite a few things. Kmart is the perfect place to gear-up when you need cheap stuff that doesn’t have to last too long. In less than an hour, we had everything we needed to hit the road in the morning. When we woke up the next morning, the clouds had cleared and the sun was shining for our long drive south to Dunedin. You’d think we’d never seen mountains before with the way we were ogling over the Southern Alps and taking a million photos from the moving car. While we loved living in Colorado, we always said that if there was a place with mountains like the Rockies and a turquoise blue sea, it would be heaven on earth. New Zealand must be that place. You can nearly see skiers coming down the white-capped mountains while you’re standing on the beach with a view of the endless blue ocean. We started discussing our plans to move here only two days into our visit. 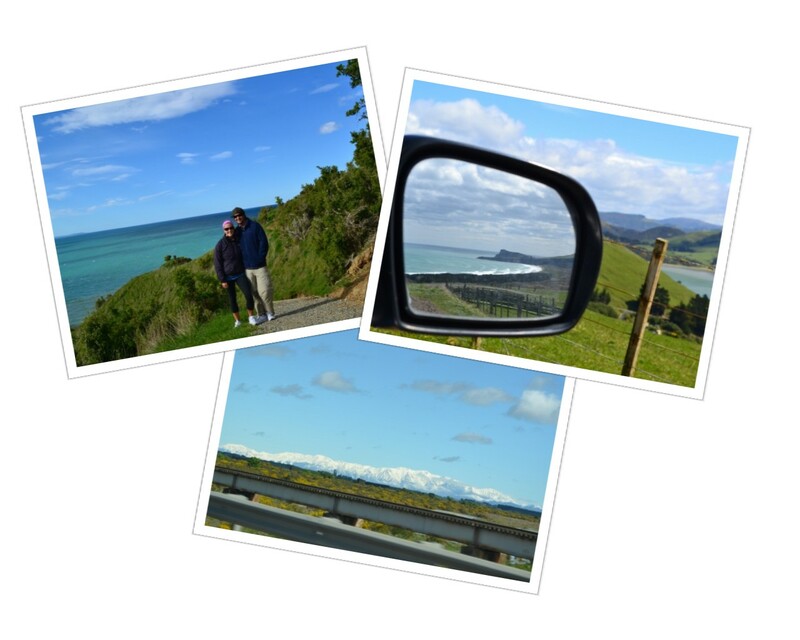 To break up the nearly 400km drive from Christchurch to Dunedin, we made several stops along the way. The first was for a “Driver Reviver.” We think this is the coolest thing ever; free coffee at a rest stop and with a clever name to top it off. The next stop was a picnic lunch along the Rakaia River with gorgeous views of the snow-capped mountains, and just before the longest bridge in New Zealand (yes, that’s right, our atlas told us so). Following lunch and a few hundred more kilometers, we broke off the highway at a town called Oamaru. It reminded us of Leadville, Colorado, but on the water. Just up the road is another quaint sea village called Moeraki, where the ancient Moeraki Boulders are located (basically, round orb-like stones on the beach where tourists take pictures). 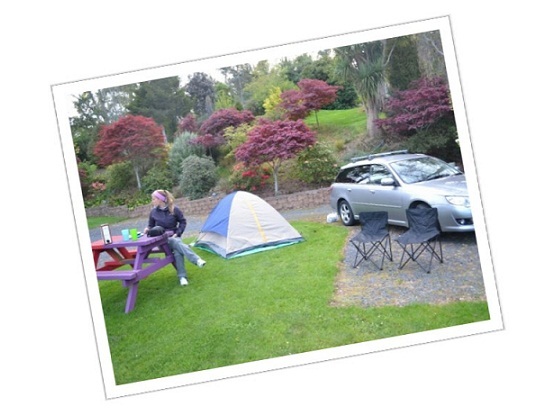 By the time we made it to Dunedin the day was almost over, so we pulled into a holiday park where we set up camp. Holiday parks in New Zealand are similar to KOA Campgrounds in the US; mostly electrical RV sites with some space for tents (only crazy people like us stay in tents this time of year) and tons of facilities like kitchens, showers, hot tubs and computer rooms. Despite it being a more commercial camping experience than we’re accustomed to, we were stoked to be sleeping in a tent after a summer without any camping. At about 2am we realized what a terrible mistake we’d made. It was freezing cold and our 55˚F sleeping bags weren’t providing much comfort. 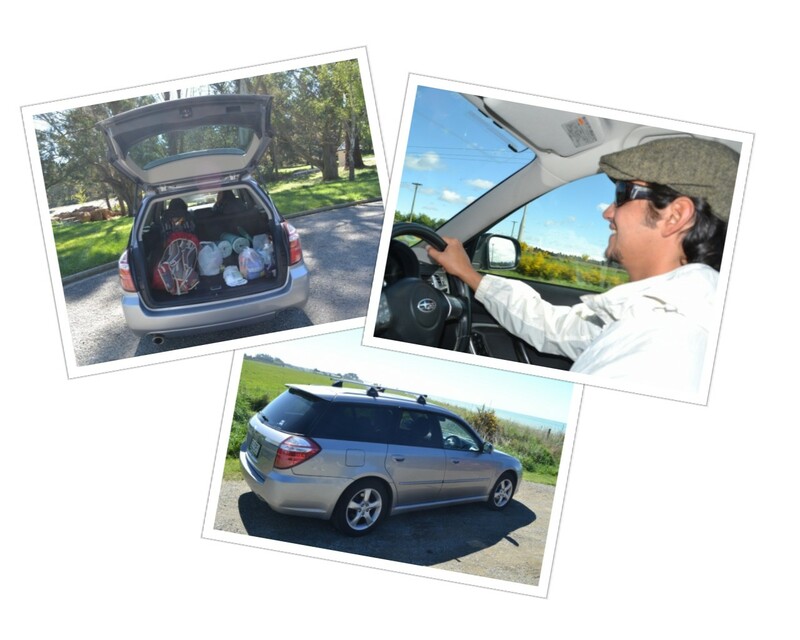 Thankfully the rental company had upgraded us to a Subaru wagon, so we changed our plans a bit and have been sleeping in the back of the car instead of the tent. 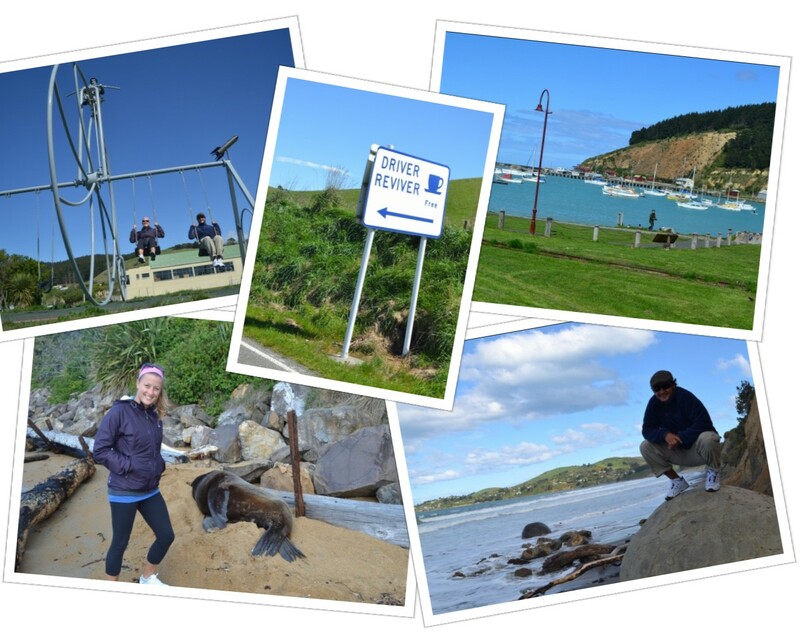 We set out in the morning to explore the Otago Peninsula. 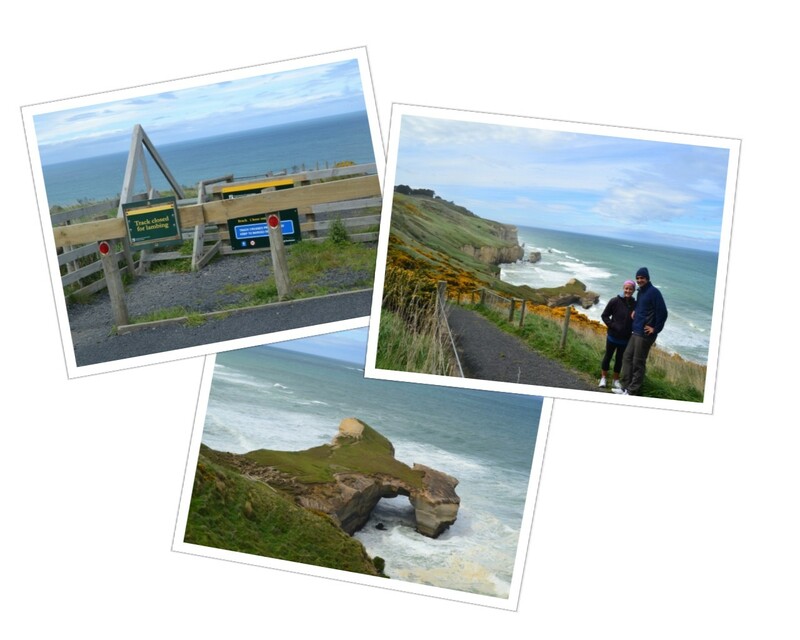 It was a gorgeous drive along the main road that winds along the north coast all the way to the tip where there are stunning cliffs and an albatross center. On the way back we took dirt roads that led us to inlets and viewpoints where we saw no other cars. There are sheep farms everywhere, and being the time of year that it is, their coats are thick and almost ready to be sheered. 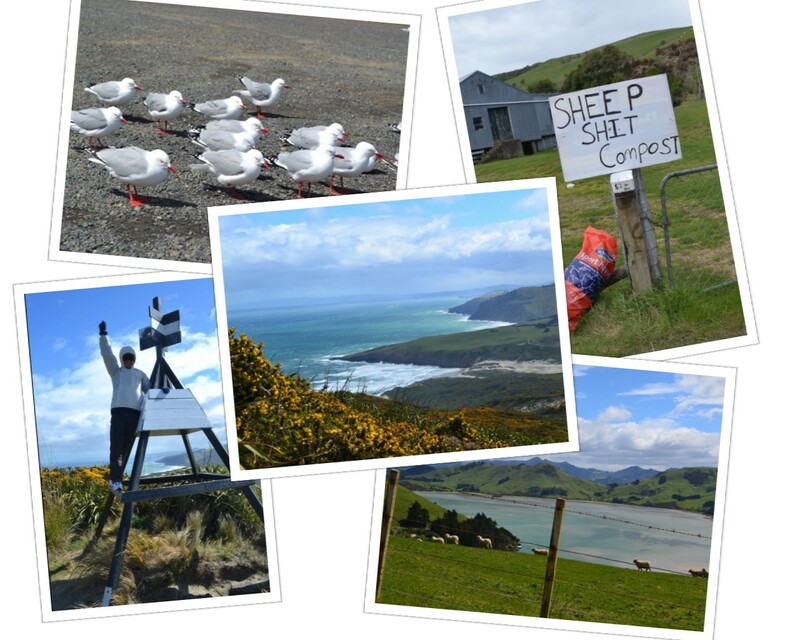 Our final day in Dunedin was spent exploring more of the country side. One of the greatest things about New Zealand is that you never have to drive far to get out of the city and into nature. The transition from buildings to open spaces happens quite quickly. Our first stop was a short hike down to some cool cliffs known as Tunnel Beach. We pulled into the trailhead parking lot only to find a sign posted which read “Closed for Lambing.” Many trails that we had encountered the day before had similar signs posted making it difficult to find a nice trail. Now don’t share this next part with anyone, but we did something naughty…we ignored the sign, climbed the fence, and hiked the trail anyway. Nothing like a little excitement to get the day started. For the record, we did not encounter any sheep or lambs along the way. What we did see was more majestic New Zealand landscape. Having a car for the next few weeks is an exciting prospect. For months now, we have been relying on public transit to make our way around the world, but in New Zealand we will come and go as we please. We don’t have a guidebook, but we did buy an awesome road atlas, so our days are sure to be filled with countless scenic lookouts and quirky informational plaques. Here’s to the open road! Great pictures 🙂 Kmart ja-ja. Glad you are staying warm! LOVE THE LEFT…for many reasons.